For photographers who need longer battery life with Speedlite flashes, the standard has been very expensive Quantum battery packs. Typically around $300+ dollars (seen here via B&H). 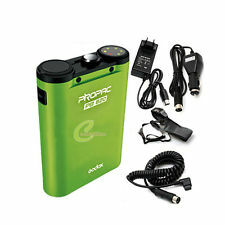 There are a few cheap external solutions that use 6x AA batteries (seen here on eBay) , but they are merely extended power sources and often don't help to improve recycle times. 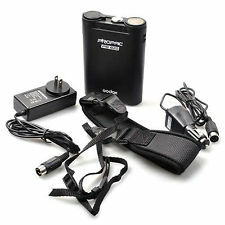 Now a popular product making rounds in the last year as an alternative is the GoDox external flash battery packs . GoDox also have a variety of other lighting products including large studio strobes and continuous lights. I had a brief look at these products over at the PhotoPlus Expo in New York, and these battery packs look very good. The Godox external flash battery packs are available for Canon, Nikon, and popular Yongnuo flashes as well found via eBay (Click here). Posted in Flash Photography Projects. 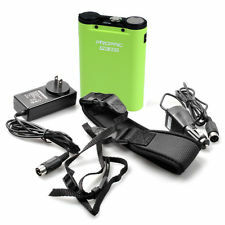 Tags: canon flash, External Flash Battery Pack, Nikon Flash, speedlight, Yongnuo Speedlite on November 11, 2012 by Emm. 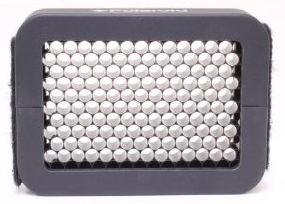 Posted in Equipment Reviews, Flash Photography Projects, LED video lights. 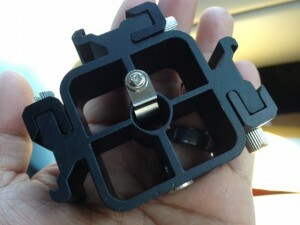 Tags: Triple Flash Adapter on August 31, 2012 by Emm. 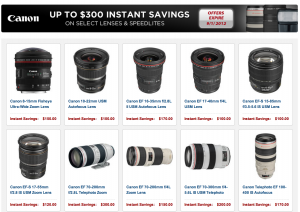 Reminder that the B&H Canon Lens and Speedlite Rebates expire next weekend. These are instant discounts like $300 off the famous Canon EF 70-200mm f/2.8L IS II USM Telephoto Zoom Lens or $120 instant discount on my favorite Canon 100mm F/2.8 IS Macro. Find more details about all the discounts available following the link to the rebate page via B&H (Click Here). Posted in Flash Photography Projects, Lens Talk. Tags: canon lens, canon rebates, canon speedlite on August 24, 2012 by Emm. 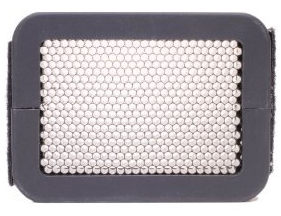 A honeycomb grid on your flash helps direct and concentrate light, and depending on the design of the honeycomb you can even achieve a very tight spotlight. YouTube member CAMPHOTOPIX shares his DIY grid build that is based on a bunch of cut straws. I'm not sure where this first started from, but it's an old DIY build that even I have tried years ago. It's very effective and you can customize the length of the straws for different effects. I also like his use of neoprene material for a very snug fit. These grids were very expensive a few years ago, but if you lack the patience, you can now find similar style honeycomb grids for less than $13.00 dollars shipped. You can find them in 1/8" and 1/4" honeycombs on eBay (click here). 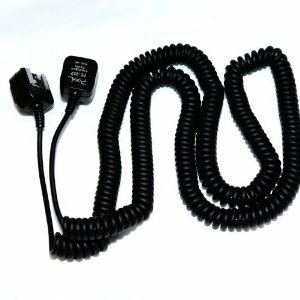 Posted in DIY Equipment, Equipment Reviews, Flash Photography Projects. Tags: DIY flash, DIY grid, flash grid, honeycomb grid, Speedlite Modifier on May 25, 2012 by Emm. Posted in Flash Photography Projects, Lighting. Tags: canon flash, Nikon Flash, Wireless Flash Trigger Receiver, YN-RF602, YN-RF603n, Yongnuo RF603 Trigger on May 20, 2012 by Emm. 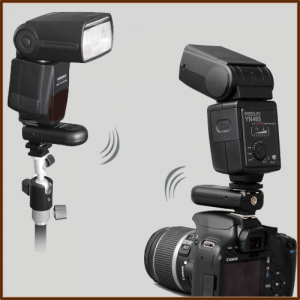 There's been some recent comments about off camera Flashes and the cheaper RF-602 or RF-603 wireless triggers. If you decide to go this route, remember that the trigger fits directly underneath the flash. Once you have this set up you can screw a light stand directly underneath the RF-602 receiver's 1/4-20 thread mount, but this means your flash can't be tilted and it doesn't provide a way to mount an umbrella. I'm using a few cheap umbrella holders that have locking shoes, and they start at about $4 dollars. Posted in Flash Photography Projects, Photography Gadgets. Tags: rf-603, yongnuo rf-602 on November 22, 2011 by Emm. 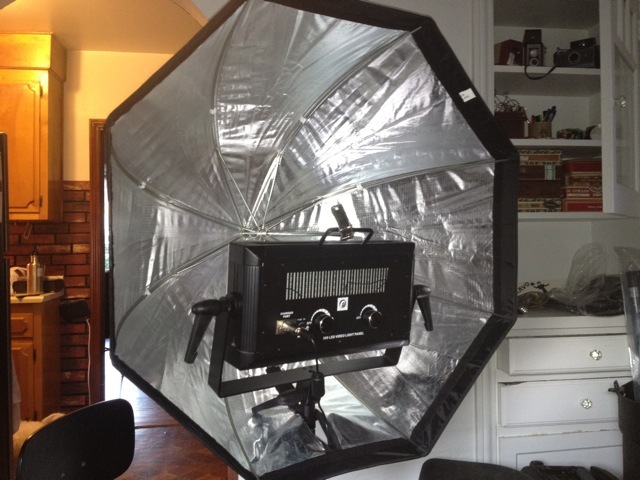 I just received my Octagon softboxes that are used as a light modifier for flash photography. They set up super fast like umbrellas but function more like traditional softboxes. I'll do a video later about how easy these things go together with my Speedlights. 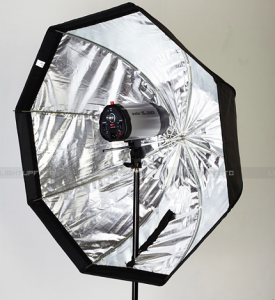 Normally you would use a strobe in the brolly, but the slotted design can be used for other light sources. Gabriel is already experimenting with using a 500 LED video light panel inside (photo above). He had to add a clamp to hold the umbrella in place. It blocks a bit of space, but should still help to change it from a small light source to a larger softer light source. Could even help with the multi-shadow issue that LED lights can sometimes cause. I'm curious to see the results. [Thanks Gabriel]. They also come in a large square version that still pops open like an umbrella. You can find more information about these following the link to the original article (click here). Posted in Equipment Reviews, Flash Photography Projects. 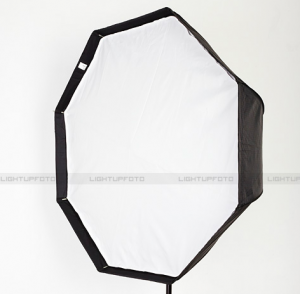 Tags: apollo, octagon softbox, pop up softbox on November 10, 2011 by Emm. [Update] Looks like the first seller is out of stock. Amazon has shifted to another seller with a $70+ dollar price. No news on any cancelled orders (yet). Posted in Flash Photography Projects on October 27, 2011 by Emm.